David Heckman’s draw toward a career in Landscape Architecture was, fittingly, quite natural. Heckman initially arrived at Temple fresh out of high school in 2007 seeking a degree in biology with a focus on horticulture. After taking a few years detour working for a landscaping company and a local Wawa, Heckman said he knew it was time to return to the classroom. Heckman has had the opportunity to take a deep dive into design with two Philadelphia Flower Show experiences under his belt. He was among the team of students to design and build Temple’s 2017 award-winning exhibit, Nieuwpolders: Regenerating the Dutch Custom of Land Recovery. He also volunteered his time to help put the finishing touches on the Department of Landscape Architecture and Horticulture’s 2018 exhibit, Within Reach: Unlocking the Legacy of Our Hidden River, which also garnered several awards. During his time at Temple, Heckman said he and his fellow students have had the opportunity to work with a variety of real world “clients,” providing design concepts and plans that in any cases have become reality. Back home, Heckman is already putting what he has learned inside and outside the classroom to good use. He has been a member of the Spring Mount Parks and Recreation Board for nine months. Like a lot of small towns, Heckman said, development has occurred randomly, which has fractured open space — a detriment to animal habitats and ecosystems — and provides little infrastructure for sidewalks or cyclists. 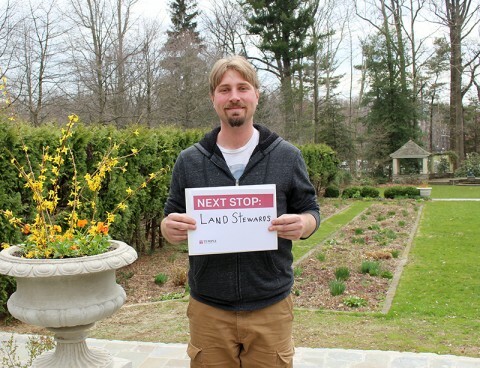 Outside of the classroom and board meetings, Heckman is a member of the team at Land Stewards, an ecological design-build maintenance company, where he will be continuing his career following graduation. To receive current news and information from the department and university, please update your e-mail address by visiting - www.alumni.temple.edu.